Was very pleased with range. I doubted it would transmit through as many walls, but it did. Excellent product for the money. The online help is great but the startup guides could be more informative. This is the 3rd Defender system I have purchased. At first I was overwhelmed with the high tech features. After a short session with a customer rep I thought I was ready to go. But found out I needed more technical help. After some phone calls I was connected with Suzanne. She was absolutely great and very knowledgeable about my specific model. She was patient and very understanding of my concerns. I hope if I need to call again I will get her from the support center as she was wonderful and product information is her strong point. She knew the system well. So I am pleased with the system so far. I may take advantage of the upgrade Suzanne explained to me. The purchase of this product initially was for our home after my shop was broken into and many power tools stolen. However, we also have a deer camp which is very isolated so we chose to put this camera system at our camp. It was extremely easy to set up, very intuitive, and worked very well right out of the box. The video quality is excellent and we feel much more secure about our investment in the woods because of the system. We spend perhaps two weekends a month there and now we will be able to see not only any intruders that might attempt to approach our cabins when we are not there, but just for the fun of it we will be able to see other camp members coming and going in our camp. My wife and I were so pleased with it, we immediately ordered an eight channel system to put at our home. In the last two months there has been an epidemic of burglaries around our small community and if this happens to us again we want to be able to help identify these crooks. Also, the system gives my wife a better sense of security when she is there alone. Great product, very well pleased. I received my product only to have to to send the cameras back in a week, because they did not work! Customer Service is a little tricky to work with (hard to get a hold of), so be patient! This has been several weeks now, so when ever I get my replacement , I am hoping to write a better review. I bought a month ago based on the manual. Product does not match product in what I believe are 2 important features: rotate time and picture in picture for 2 pictures. Rotate time would over come the lack of pip2, pip2 would overcome lack of rotate time. With 3 cameras, need to view the cameras without personally rotating through them via the mouse or remote. Quad view too small on monitor. Picture quality is excellent, motion detection software is excellent. Support is terrible. You can only communicste by mail! Would only recommend to someone not needing the rotate or pip3. I really like the unit,nice picture,easy to use,night vision is really good. 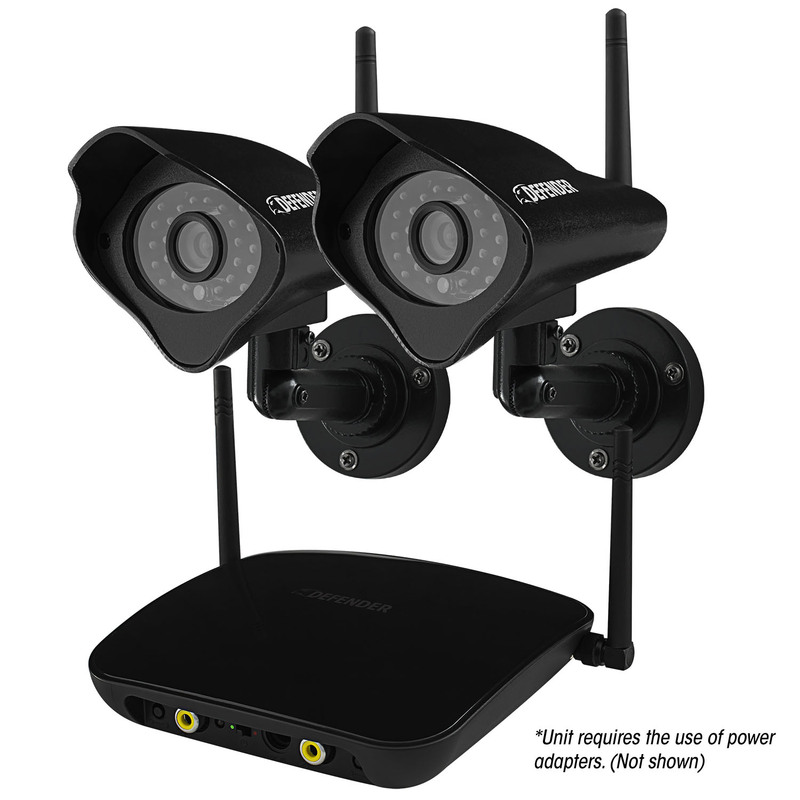 The system was easy to install, wireless cameras can install anywhere. Great for the price for general DIY home use! Bought this recently for a home shed and outdoor area. At a distance it can be difficult to identify faces but overall it's got a great reception for wireless signal and decent picture and storage space. I recently purchased this system and am totally satisfied with it. Initially I had a problem setting up the port forwarding but after researching on the web along with the system's manuals, I was able to get it to work on both my Android phone and my DDNS settings on multiple computers. My system even captured a bear ransacking the leftover bird seed in one of my bird feeders last Sat. morning at 1 AM. Showed some of my co-workers and some of them seem interested in getting a system.